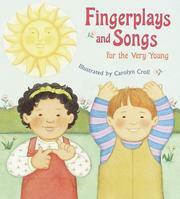 Fingerplays and songs for the very young / illustrated by Carolyn Croll. 100 ME:PersonalName 1 $a Personal name Croll, Carolyn. $c Statement of responsibility illustrated by Carolyn Croll. $c Date of publication, dist, etc c2001. 500 General Note $a General note Title taken from cover. 500 General Note $a General note On board pages. 650 Subj:Topic 0 $a Topical term Nursery rhymes. 650 Subj:Topic 1 $a Topical term Songs. 650 Subj:Topic 1 $a Topical term Finger play. 730 AE:UnifTitle 0 $a Uniform title heading Mother Goose.